A branch of the Syrian Finance Ministry has officially banned using iPhones in the country. The motivation behind of the decision is to avoid sharing videos and news of the massive protests, ongoing in the country. The ban has occurred as soon as the Syrian government was increasingly isolated by the West and its Arab neighbors. 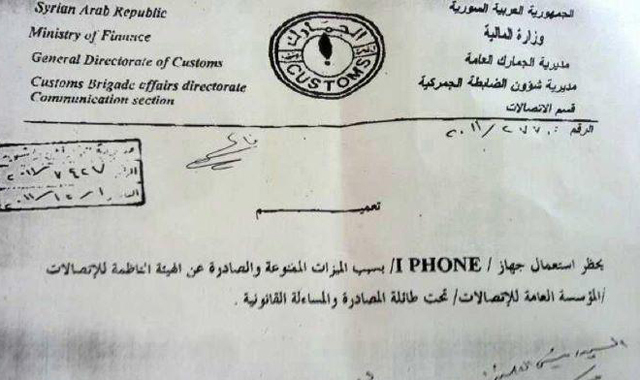 Customs Department of the Syrian Finance Ministry affirmed: "The use of the iPhone must be prohibited due to the forbidden features that have been banned by the general telecommunications company. (…) This is a legal ruling and iPhones will be seized." Journalists and not only they used the device to spread visuals of a violent crackdown of antigovernment protesters. Syria has barred foreign media from the country but visual information has spread easily. The situation is very serious because while rebellion 4.000 people have died since March. In November the activists launched an application for iPhone and iPad. The application is called Souria Wa Bas and it means “Syria that is all.” With the application’s help, its users could share news, photos, videos; they could locate places of opposition hot spots too. The application was intensively used for jokes about Assad also. Consider that Steve Jobs’s father is Syrian and we can affirm that his great invention is banned in his own country. As for his father, he has come out against the government and said: "I am in solidarity with the Syrian people; I reject the brutality and killing that the Syrian authorities are committing against the unarmed Syrian people. And because silence is participation in this crime, I declare my participation in the Syrian sit-in on YouTube." Social network is used while rebellion as well. Some protests were organized with Facebook’s and Twitter’s help. It was used for spreading some confidential information too. Maybe banning the social networks is next step in Syrian Government’s time-table.